This volume is made up of four manuscripts bound together. 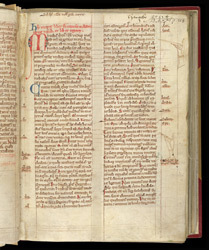 One section was at Hagneby Abbey, Lincolnshire, in the 15th century, when 'Hangeby' [sic] was inscribed in the top right corner of this page. The Imago Mundi (Image of the World) is a cosmographical and historical work of uncertain authorship. A medieval reader has marked passages of particular interest in the margin, with pointing hands.